India Vs Srilanka test series faced the criticism of flat pitches all the way through but the end was rather very interesting. The last test match was like a see saw! The match kept bouncing from one court to the other. Was very difficult to predict the winner till the end of 4 days... But it was India who showed the courage to go ahead and win the last test match and level the series 1-1. 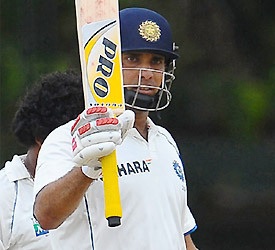 VVS Laxman went on to hit a splendid ton and save India from losing the test match. Infact the innings was good enough for India to register a comprehensive win in the end. He was awarded Man of the Match whereas Virendar Sehwag was awarded Man of the series. India continues to lead the ICC test rankings for the teams.